Place porcini mushrooms and sun-dried tomatoes in a small bowl. Cover with boiling water; let stand 5 minutes. Drain, reserving 3/4 cup liquid. Squeeze mushrooms and tomatoes dry; coarsely chop and set aside. In a large skillet, saute onions in oil until tender. Add garlic; cook 2 minutes. Add reserved mushroom liquid, wine, thyme, fresh mushrooms, tomatoes, sugar, salt and pepper. Bring to a boil. Reduce heat; simmer, uncovered, 10-15 minutes or until thickened. Stir in porcini mushroom mixture. Meanwhile, preheat oven to 375°. Cook pasta according to package directions. Drain, reserving 1/2 cup cooking liquid. 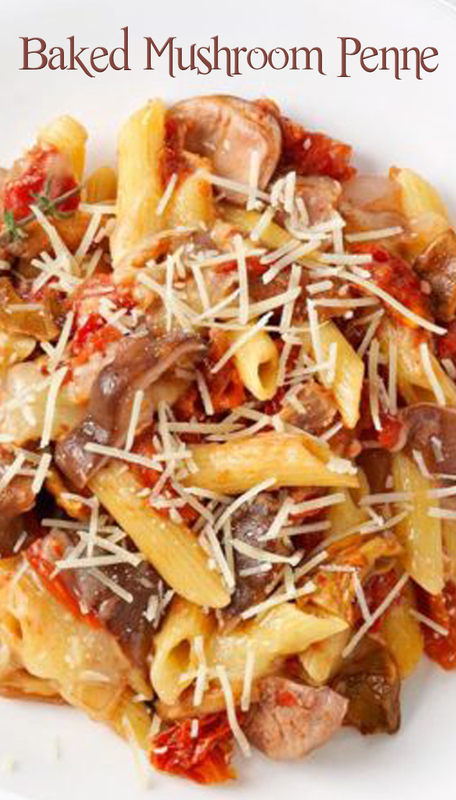 Toss pasta with the cooking liquid, mushroom mixture and 1/2 cup Parmesan cheese. Place half of pasta mixture in a greased 13x9-in. baking dish; top with half of the mozzarella cheese. Repeat layers. Sprinkle with remaining Parmesan. Cover and bake 15-20 minutes or until heated through.